Where can I learn more about North Carolina traffic laws? The North Carolina Driver’s Handbook provides guidance on North Carolina driving laws and licensing. You can also find other laws at NCDOT Road Rules. How can I request a presentation? Contact us at ncvisionzero@gmail.com to request a presentation or guest speaker for your event. What is the history of Vision Zero? 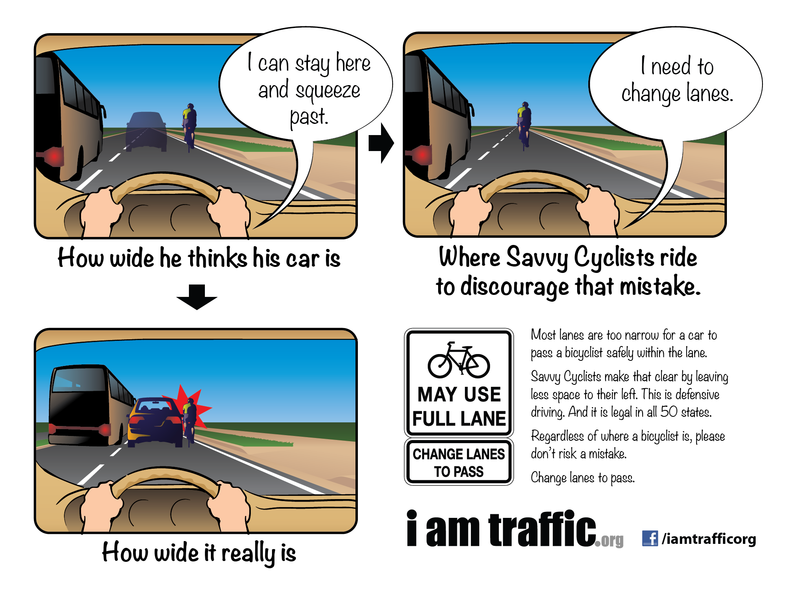 The safest place to ride is with traffic, on the right side of the road. Bicycles are considered vehicles and have a right to use the full lane. If the lane is wide enough to allow motor vehicles to pass safely, ride on the right side of the lane. 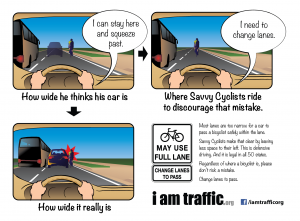 If a vehicle cannot pass you within the lane without hitting you, it is safer to ride in the middle of the lane, which encourages vehicles to move over a lane to pass. For more information, visit Bike Walk NC. How often do I need to replace my bicycle helmet? Replace your bicycle helmet any time it has been involved in a crash or is physically damaged. Keep in mind that after a crash, a helmet may look intact, but the foam inside a helmet is not able to withstand more than one hard hit. A properly fitted bicycle helmet should comfortably touch your head on all sides, and should stay in place when you shake or tilt your head to either side. The helmet should sit level on your head and low on your forehead, leaving space for one or two finger-widths above your eyebrow. The chin strap should be tight enough that you can only fit one or two fingers under the strap. For more information, check out “Easy Steps to Properly Fit a Bicycle Helmet,” published by NHTSA. Are bike lights required when cycling at night? Yes. Bicyclists riding at night must have an active, white front light (visible from at least 300 ft) and a rear, red light (visible from 300 ft) or reflective clothing. Are bicyclists required to ride in bike lanes? North Carolina law does not require bicyclists to ride in bike lanes. Ghost Bikes serve as a memorial for a bicyclist who was hit or killed on the road. Ghost Bikes are painted all white and are typically stationed at the location where a bicyclist was killed. It is recommended that you keep your child in the back seat at least through age 12. When is it safe for children to ride without a car seat? Keep your child in a car seat as long as possible while they are still within the manufacturer’s height and weight requirements. How do I install a car seat? NHTSA has provided guidelines and a series of videos for installing a car seat. How can I know if my child is in the right car seat? You’ll want to choose a car seat based on your child’s size and age. NHTSA has developed guidelines to help you decide on what is safest for your child. You can also stop by a Child Car Seat Inspection Station to have a technician check your car seat. Is talking on a phone more dangerous than talking to a passenger? Yes. Unlike a passenger riding in the car with you, a person on the phone is not able to see when road conditions change suddenly. In a dangerous situation, a person in the car with you may help you out by saying “watch out!” However, a person on the phone will continue to talk, unaware of any potential danger, which can be an added distraction, making it more difficult for you to react safely. Is it safe to drive while using a hands-free device (Bluetooth, etc.)? Get a good night’s sleep (7-9 hours) before driving. If possible, travel with a companion and ask him or her to stay awake with you. Schedule regular stops along the way and avoid medications and alcohol. What should I do if I get sleepy while driving? The best thing to do is to pull over to a safe location (off of the highway) and take a nap. Drinking caffeinated beverages (the equivalent of two cups of coffee) can also help, but should not replace sleep. How can I tell if I am too drowsy to drive? If you are having difficulty focusing, feel like you have “heavy eyelids,” find yourself drifting out of the lane, yawning a lot, or can’t remember the last few miles driven, you are too drowsy to drive. BAC refers to either Blood Alcohol Content or Breath Alcohol Content. When blood is tested, the result is reported as grams of alcohol per 100 milliliters of blood. When breath is tested, the result is grams of alcohol per 210 liters of breath. A BAC of 0.08 using a breath testing device is 0.08 grams of alcohol per 210 liters of breath. Is it legal to drive in North Carolina as long as my BAC is lower than 0.08? No. There is no legal limit in NC. Driving with a BAC of 0.08 is illegal. Driving while impaired is illegal in NC even if your BAC is less than 0.08. Alcohol affects people in different ways. Studies show that some impairment occurs at 0.02 and everyone has impairment at 0.04. It is best not to drink alcohol and drive. Also, it is illegal for anyone under age 21 to drive with a BAC above 0.00. Alcohol is a depressant of the central nervous system, which is responsible for motor function, understanding, thinking, reasoning, and taking in information through the senses. Drinking alcohol can lead to hazy thinking, impaired vision, and slowed reaction time. (American Association for the Advancement of Science). How can I track my BAC level? You can calculate your BAC using online tools. There are also phone apps designed to help you calculate your BAC. However, rather than trying to keep track of all the variables of BAC, it is better to not drive after consuming any amount of alcohol. You’re smarter than that. What should I wear when I ride? Your DOT-certified helmet should grip your cheeks, your jaw, and the top and sides of your head. Wear well-ventilated goggles, glasses with safety lenses, or a helmet equipped with a face shield to protect you from insects, dirt, and wind. Non-slip, durable gloves help to grip your controls and keep air out of your sleeves. Firmly padded gloves can help protect your hands if you are involved in a crash. Wear a padded or reinforced jacket to provide some protection from abrasion in the event of a tip-over or crash. Always wear fitted long sleeves and long pants to keep from getting anything snagged on your motorcycle. Wear something brightly colored and/or reflective on your upper body. Tennis shoes, sandals, or cowboy boots don’t cut it. Choose a motorcycle boot with a stiff rubber sole, ankle coverage, and tough material to protect yourself from flying debris or injury during a crash. Also, avoid dangling shoe laces. How often should I replace my helmet? Most manufacturers recommend replacing your helmet at least once every five years. The polystyrene inside of helmets becomes brittle as it ages. Sun exposure, chemicals, body fluids, and “wear and tear” can all lead to helmet degradation. Always replace your helmet if it is involved in a crash. Is it safe to buy a used helmet? No. You should never purchase a used helmet. Because of the hard outer shell, it is impossible to tell if the polystyrene inside is already compressed from previous damage or a crash. If the polystyrene is already compressed, the helmet will not protect you in the event of a crash. How can I tell if my helmet is DOT certified? Compliant motorcycle safety helmets will have a DOT symbol permanently installed by the manufacturer on the back of the helmet. A sticker placed on a helmet is NOT certified. No, not always. Drivers must yield to pedestrians in crosswalks –even if the crosswalk is not marked (WatchForMeNC). However, pedestrians are extremely vulnerable road users, and drivers should always be alert for anyone traveling on foot. Where is the safest place to walk? When available, always walk on the sidewalk. In areas with no sidewalk, walk facing traffic and as far away from traffic as possible. What is the safest way to cross railroad tracks? The only safe place to cross railroad tracks is at designated crossings with flashing red lights or a gate. Crossing anywhere else is dangerous and illegal. How does the weather impact stopping distance? When there is water on the road, your tires will have less grip on the road surface. Inclement weather may also make it harder for you to spot obstacles in the road. Any time that you are driving in adverse weather, slow down and always leave more space and stopping distance between you and the vehicle in front of you. Who determines the speed limit, and how? Roadways are designed to accommodate certain speeds. Any change in the speed limit will first be investigated by a traffic engineer to determine a safe speed for the road conditions and area. (NCDOT). When was the seat belt law started? In 1993, North Carolina was the first state to initiate a statewide Click It or Ticket enforcement campaign in the United States. Driver seat belt use in the state rose from 65 percent to 81 percent by July 1994 (NHTSA). Can a seatbelt injury me during a crash? Any injury sustained from a seat belt will be significantly less severe than being thrown from a vehicle onto the road. Without a seatbelt, you are 30 times more likely to be ejected from a vehicle in a crash. If you are ejected from a vehicle, there is a 75% chance you will be killed. Why does it matter that all passengers and drivers wear a seatbelt? In a crash, any unbuckled person becomes a deadly missile. In a 30 mph crash, a person not wearing a seatbelt can have as much force as a small SUV. An unbuckled person flying through the car can serious injure or kill other passengers. Where can I learn about proper installation of my child’s car safety seat? NHTSA has developed guidelines to help you decide on what is safest for your child. You can also stop by a Child Car Seat Inspection Station to have a technician check your car seat. School buses are safest way to get to and from school. Of the student fatalities that happened during normal school travel hours, 58% of students were traveling with a teen driver, 23% were traveling with an adult driver, and 1% were traveling by school bus (NHTSA). What safety features are available for school buses? Why are speed limits lower in work zones? Slower speeds protect motorists and those working in the construction zone. Traffic shifts, construction activity, and physical hazards may be present in a work zone. Slower speed limits give all motorists more time to react safely in changing conditions. What is the Graduated Driving License (GDL) program? The Graduated Drivers Licensing program is a three step process which allows young drivers to acquire more driving experience before receiving full license privileges. The GDL program in North Carolina requires supervised driving hours, restricts driving times, and restricts the number of passengers for young drivers. For more information on the NC GDL program, download this brochure. Why do younger drivers have a higher risk of being in a serious crash? Young drivers have less driving experience, and are more likely than older drivers to underestimate dangerous situations or not be able to recognize hazards (Jonah & Dawson, 1987). In 2016, there were 13,519 commercial motor vehicle crashes in North Carolina, resulting in 146 fatalities (NCDOT).